God's eyes are one of the easiest crafts you can make, and they're versatile because you can create them in any color. For a harvest celebration like Mabon, make them in fall colors -- yellows and browns and reds and oranges. At Yule, the winter solstice, you can make them in reds and greens. You can also try doing one in black and silver to celebrate moon magic. If you'd like to make one for your household altar, you can make it in colors that correspond to your family's deities and traditions. You'll need two sticks of equal length -- I like to use long cinnamon sticks, but you can use a dowel rod, popsicle stick, or just branches you've found on the ground. You'll also need yarn or ribbon in different colors. If you like, you can include decorative items like shells, feathers, beads, crystals, etc. By using alternating colors of thread or yarn, the finished result looks like an eye. In some traditions, you might associate the four points of the cross with the four classical elements, or the directions on the compass. You could even see them as representative of the four major Sabbats -- the solstices and the equinoxes. 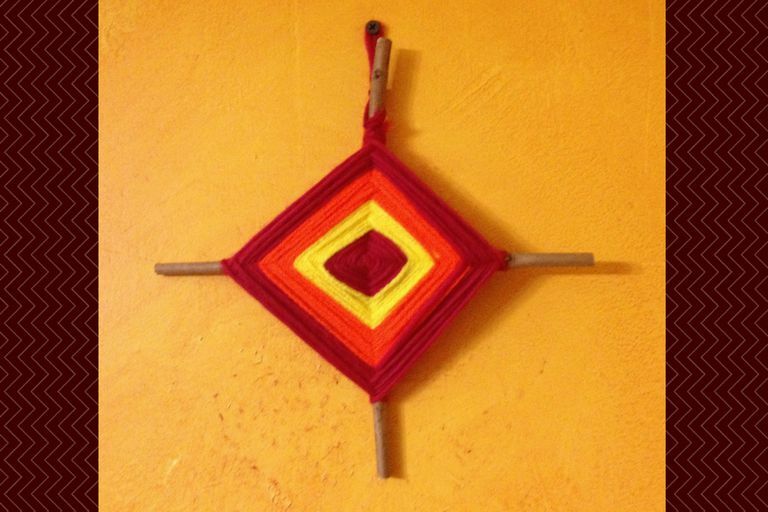 One great thing to do while making god's eyes is use them as a spell working in themselves -- visualize your intent while wrapping the yarn, whether it's protection for your home and family, to bring love your way, or even a prosperity talisman. To begin, hold your two sticks together in a cross. If you'd doing this with children, it's a good idea to put a small dab of glue on here to prevent slipping. Wrap a length of yarn one or two times around the top arm of the cross, right where the two sticks meet, going counterclockwise (be sure to hold the loose tail in place and wrap the yarn over it to keep it from unraveling later). As you come around on the left side of the upper arm, cross down and over to the bottom side of the right arm. Bring the yarn out behind the top of the right arm, and cross over to the left side of the bottom arm. Finally, bring the yarn from the right side of the bottom arm across to the top side of the left arm. This is actually easier than it sounds -- follow the excellent diagram on Aunt Annie's Page to see how it works. Continue wrapping the sticks in the same order until you have a good amount of the color you're working in. Then switch to a new color, and continue the process until you want to change again. Finish it off with a length of yarn tied in a loop, so you can hang your god's eye. Finally, you can decorate the ends of the sticks with feathers, ribbons, beads, or crystals, whatever you prefer. Hang your god's eye on a wall, or use it on your altar for Sabbat celebrations.